Bristol Commercial Vehicles began manufacturing chassis in 1908. 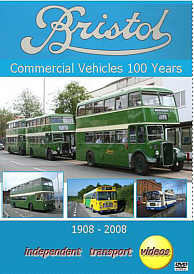 One hundred years on in 2008 we celebrate with this video programme the marque that has faithfully served the bus industry. We first look at Bristol vehicles that have survived into preservation, then with the help of archive cine film, Bristol buses in action from all over the British Isles. Our programme starts at the 2007 Bristol Harbourside Rally with a cavalcade of Bristol Omnibus KSWs on a run from Bristol Centre to Westbury-on-Trym. The vehicles were a familiar sight on this route during the 1950’s and 1960’s. We travel on board two of the vehicles through the city centre, over the Downs to Westbury and back to the rally site at the newly developed Harbourside. We then move our venue to Winchester for ‘Bristol’ highlights at the famous January 1st Rally. Filmed over a number of years we see Bristol vehicles from various former Tilling fleets in action. From here we travel to North Wales to visit the Llandudno rally, again film from recent years of ‘Bristols’ from the Crosville and Red & White fleets as well as Bristol Omnibus and Warrington Borough council to name but a few. In October 2005 a rally in Swindon was held that featured many ‘Bristol’ vehicles. Our cameras captured the action for you to enjoy. We then feature a montage of yet more preserved Bristols in action from all parts of the UK. Badgerline RELL6L 1257, Ulsterbus RELL6G 2583 and Western National VRT 1056 are covered more fully in a video profile, before we leave this section of the programme to see archive footage from the cameras of Bob Gray and Graham Thorogood. Here we see Bristol vehicles in action from Scotland to the south coast bringing back many memories of these fine vehicles in action.